Walking into a big science fiction convention in 1978 was just about the only place on earth where you could find living artists, otherwise known as professional science fiction and fantasy illustrators, who made big narrative paintings, paintings as fantastic as Bosch, full of people (and aliens!) who looked real. Seeing these paintings up close was a transformative experience for me. It took my breath away! Sometimes from across the room they seemed as slick as glass, but as I approached them, they dissolved into a multitude of translucent brushstrokes. They were (and are) beautiful and amazing to look at. I would have loved to take classes from one of these painters but I never got a chance or even heard that any of them taught (most of them, I learned, worked 10 – 12 hours a day nonstop), not that I could have afforded it at the time. But luckily many of these amazing illustrators were willing to share knowledge, so I picked up tidbits of skill here and there. Then I went back to school, got a degree in art, and taught myself as much as I could. I ended up going to a lot of science fiction conventions and showing my art myself, and who knows, I might do it again. I never made tons of money, and working twelve hours a day was out when my kids were small, but when I could I stayed up all night painting. (I remember making a pot of coffee one night and painting pictures of hands over and over until I got it right). I did some novel covers, some card art and sold my prints at conventions. I met my wonderful husband, and made a wide circle of friends. 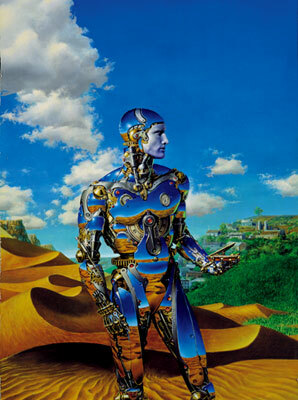 I still feel a very deep affinity for the world of science fiction and fantasy painting. So when I heard in late 2013 that he was having a one-man show at the Huntsville Museum of Art, I wouldn’t have missed it for the world. Huntsville’s only a couple of hours from home and my sister and her family live there, so we made it a side trip during a holiday visit. I couldn’t remember seeing a museum like this showcasing the work of one illustrator since the Hunter Museum in Chattanooga had had a Norman Rockwell show in the their downstairs gallery thirty years before. Over the last decade, Donato has pioneered the ever-so-delicate crossover between “fine art” and “illustration,” breaking down that largely imaginary wall, a wall that never really existed until a hundred years ago. He’s been a finalist or prizewinner several times in the Art Renewal Center’s painting competition, along with a number of other illustrators in the field. The Huntsville show demonstrated that these once-immutable walls are dissolving fast, and fastest for painters in the fantasy illustration field, where the skillset bar has long been set very high. I’m glad that these doors are finally opening, because they deserve it, and it’s about time. I was especially entranced by a series of Merman paintings – this one is “The Golden Rose.” They might be illustrations for a novel. I’m not sure. Does it even matter? You can’t quite see the subtle, iridescent skin tones in this photograph of the painting, but take my word for it, they are there. 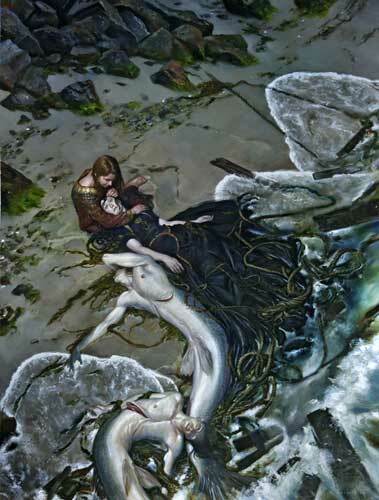 The mermen’s flesh is cold, but pearly, as if reflecting moonlight. The painting is really big, too, bigger than you can tell from this reproduction. I wanted to know — How did he get that pale coloring of the flesh? What color is that hightlight? That shadow? 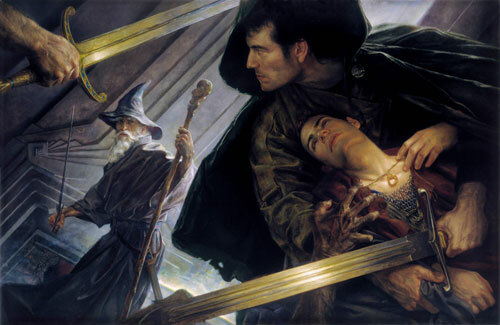 One thing I have always liked about fantasy illustration is its use of dramatic warm-and-cool lighting contrasts and bright glazes of color. But when looking at Donato’s paintings close up it’s obvious that although there is plenty of bright color (in the jewel-like older paintings especially) he also uses a lot of earth colors and muted tones in his more recent work. He skillfully manages values to achieve a look of crystalline brilliance. His work reminds me of something I read once describing Jan Van Eyck’s painting as possessing “that startling clarity that exists only in dreams.” That reminds me so much of Donato’s work, and of some other science fiction painters I have seen. I admit, when I see Donato’s work I want to possess it! I don’t mean steal it off the wall; I mean I want to do something like that. I’ve often felt that way when I walked into an art show at a big science fiction con – the best illustrators have such a mastery of color and value and narrative. They are doing more than just painting a picture of a bowl of fruit, a drapery, a human figure. They are constructing a world out of their imagination and making it exist as a film of paint, full of light. Speaking of crystalline brilliance, I turned a corner and there on the wall was this wonderful painting, “Construct of Time”! It won every prize in the book when he first showed it. It was in the early 90’s and Donato was just getting started as an illustrator in the field. I distinctly remember seeing it for the first time, but can no longer remember where! It might have been in one of the Spectrum books, but it’s possible I saw it in person at a WorldCon or some other science fiction convention. I spent forever looking at it wondering how did he do that? Because at the time it seemed absolutely beyond belief. I wonder if now our eyes have become desensitized to such beautiful work because of computer graphics, but I hope not. Computer paintshop graphics can never quite achieve this dazzling level of craft, this union of handicraft and the human spirit, although I have great respect for many illustrators who have switched over to painting programs. The big gaming companies need rapid turnover and it’s just not possible to finish an oil painting that quickly. But with computer graphics there’s no spectacular original painting to look at after the work is published. And without that, the fine art crossover can’t happen. 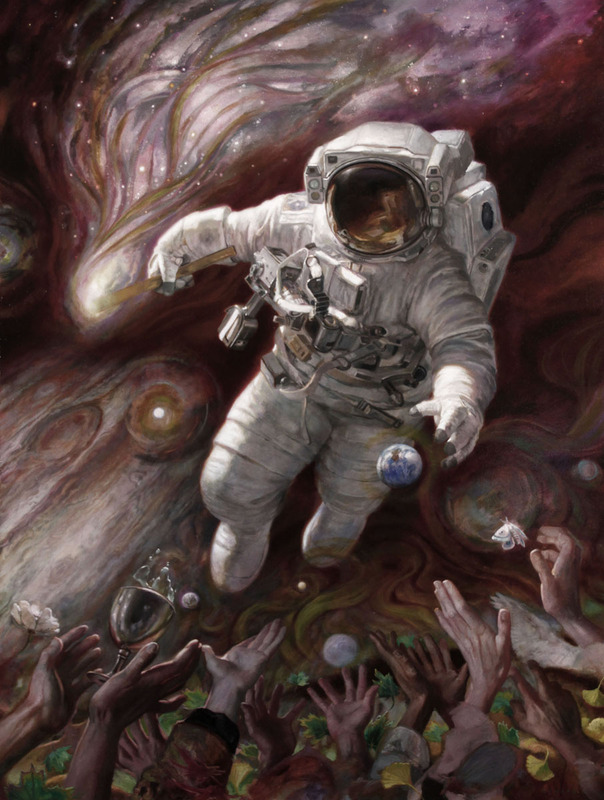 Oh, and when I first saw his astronaut paintings up close, I noticed that he employs some extremely subtle color gradations over the white astronaut’s suit. You can’t really see them in the photograph here, except for a few hints here and there. It is just too delicate an effect. This one is called “Lifeseeker.” I might be wrong, but I think he did a number of these astronaut-themed paintings especially for the Huntsville show (Huntsville being home to the famed Rocket Center). As the “white” suit curves away into shadow (and I put white in quotes because, of course, nothing is really white), instead of simply turning into gray, the light goes through a delicate spectrum of pinks, mauve and green into blue. I spent a very long time looking and trying to figure out exactly how he had done that. When I saw that effect in Donato’s work I remembered something Richard Thomas Scott had told me about the way Odd Nerdrum uses a more expressionistic language of color in his flesh shadows. Nerdrum takes the flesh color back through the spectrum into the shadow, going through red, purple and green, and I hadn’t understood it at the time. Once again, the effect is very difficult to see in a reproduction. But when I saw Donato’s astronaut I understood a little better. My husband and I spent a long time wandering through the show and I went back to my favorites several times. I stood in front of each painting for a very long time looking at the brushstrokes and the colors. In my imagination, I asked Donato questions about how he did this or that. I wish I could remember more, but as is usual at shows like this, my brain finally went into Beauty Overload. Finally we checked out the other shows in the museum and started to leave. But then as we were walking out of the front door — Oh Joy! 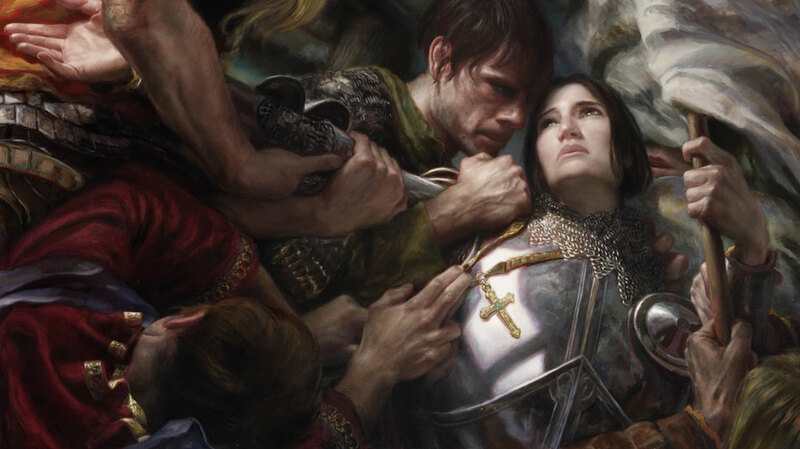 I saw a flyer for a painting workshop in January to be taught by Donato Giancola! This was too much to hope for. So I popped out my cell phone, called my sister to see if I could stay with her, and plunked down my deposit right then and there. Right after New Year, I got my painting kit together and set off for Huntsville. Donato, an energetic, cheerful, friendly guy, came up to the door of the classroom space and let me in himself. The workshop lasted three days and we started out with a talk and slide show. Donato emphasized the role of imagination and storytelling in the creation of narrative paintings. He spoke of the painter as magician. He wanted us to take our paintings that extra step beyond simply putting images on canvas. In addition to thinking of storytelling, Donato told us to think in terms of composition, or “an interesting picture.” I knew this workshop would be really good for me. 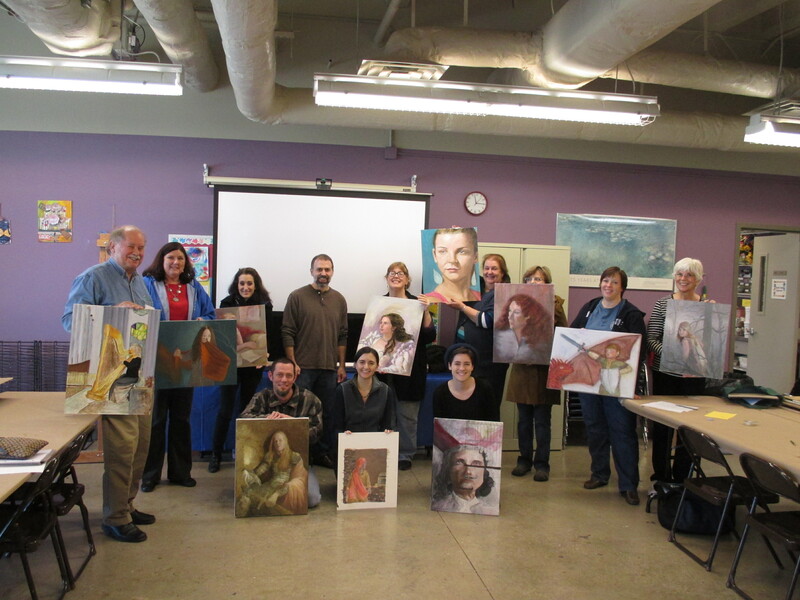 He started with a demonstration in which he showed us how he starts an underpainting. He paints very thin and loose. I realized as he worked how much of this loose underpainting is still visible in the finished works if you look closely. His paintings are never tight. He also talked about his technique for preparing the board for painting. I had heard a lot about this and was eager to learn more. Donato works out his composition and makes a detailed drawing, which he then takes to a print shop and enlarges on acid-free paper to whatever size he wishes. He then glues it down on board with matte acrylic medium and paints over it after he seals it with matte medium. This technique appeals to me for several reasons. I like the idea of starting with a fully-developed drawing because it allows more compositional control. Also, the acrylic underpainting he employs ends the need for thin washes of oil paint with solvents, and I’m trying to get away from solvents as much as possible. Finally, Donato pointed out that his technique allows him to keep his original detailed drawing (and sell it later!) It’s all good. He makes no bones about using photographic reference for his paintings, and brought a big pile of enlarged, highly detailed reference photos he’d taken of models in his own studio. We also had a lovely model pose for us for sketching and were allowed to photograph the model ourselves in various poses with props. Of course, we all know that paintings done entirely from photos can be flat, distorted, and ugly if the painter does not have a firm grounding in life drawing. I draw preliminary sketches from life, and go to life-drawing class when I can, but still often rely on my own photos for painting. When I am around my atelier friends, I feel a little embarrassed about it. But I admit, sometimes a gallery wall of sleepy nudes can put me in mind of an endless series of five-finger studies instead of a concerto — not that the exercises aren’t necessary and skill-building. But come on, make those naked people do something! Dress them up! Make them fly! Or if they’re going to lie there like they’re dead, for Pete’s sake turn them into mermen! The class had a good number of middle-aged and older painters (we are legion), but there were also a good number of young painters, one of whom was a student at the Angel Academy in Florence. The young girl sitting next to me was in high school. I painted like a demon for two and a half days on a painting that sort of evolved from one of Donato’s photos. Of course, Donato came around several times a session and gave us helpful critiques of our work. I wish I had thought to bring my own reference photos, of which I have hundreds, and my little notebook of ideas. (Hint: add that to the supply list!) We did have a chance during the workshop to access and print out some of photo files from iPhones and laptops. I never did get a good handle on any imaginative narrative; for some reason it just wouldn’t gel in my mind. Usually my imagination is going full blast, but I was working so hard on the painting process itself I couldn’t think of anything else. During a lunch break one day, I went outside, picked up some oak leaves and painted them white and started playing around with them, and this suggested the beginnings of a narrative. I had in mind Grimm’s fairy tale of “The Snow Queen.” But what I ended up with was sort of flatly realistic and devoid of magic. I’m pretty sure I worried too much over the exact likeness, a leftover from drawing portraits from life out in the hot sun in front of the Tennessee Aquarium. Plus add my scientific illustrator pickiness and I can get bogged down. So anyway, it needs work. One of the highlights of the whole weekend was when Donato gave us a private tour of the show. I got to ask him all the questions I’d wanted to ask before! To get that dead cold skin tone on the mermen he puts the photo reference in Photoshop and fiddles with the color levels. 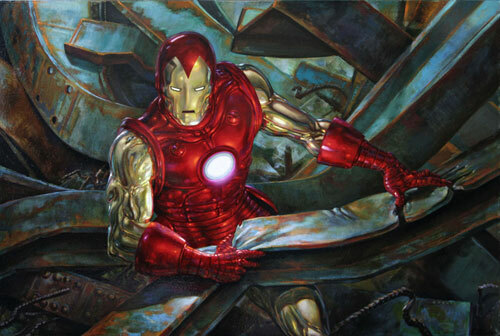 To get that amazing red on Iron Man he underpainted in red and orange and then glazed Alizarin Crimson. And he used a mirrored ball to figure out the reflections on the amazing Mirrored Robot painting. I can now look at the mirrored robot and feel my way through it. You can’t see me, but I am jumping up and down like a little schoolgirl! The workshop was worth every penny, and was lots of fun too. Here’s a photo of the whole class at the end of the workshop: We were all working so hard that I barely had time to talk to anyone until the last day, when we all went out to eat together. I met several interesting people from the Huntsville area and got to talk to Donato for quite a while too which was a treat. I was amazed to learn that he had started out majoring in engineering in college! And one of the women in the class had also been an engineer at the Rocket Center before she switched to art after a layoff. Some of my friends have said, “Julie, what is this business with pretending you don’t know how to paint? You’re whining is getting ridiculous!” Well, it’s like this: I can draw pretty well, hey, sometimes I can draw and talk at the same time, and I know all about water media like acrylics and watercolor. I can gesso my own wood panels and make egg tempera from scratch. Oils are different somehow. The Old Masters painted in oils, they invented oils, and oil painting retains an aura of the mysterious, as if the technique were some arcane alchemy which can only be learned from a master. They aren’t instant, in fact they go against all of our modern obsession with speed. Painting in oils is smelly, messy, and wasteful, a bit like life itself. But in spite of their slowness, oil painting incorporates danger and excitement: you can poison yourself and burn down your studio! What more can I say?